Ok, so I'm sorry I've been a slacker, but not really. Life is good and busy and sometimes it is just better to live life! :D As promised, here is a much needed catch-up post. 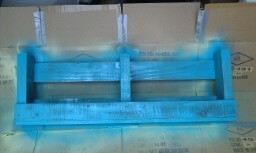 First off: Pallet bookshelves! I had so much fun making these! It was my first time using spray paint. A little sad, maybe. Fun? Yes! I used this tutorial from six sisters stuff to make mine. (scratch that. The link has been deleted. I will do this tutorial another time!) I didn't taper off the top of the bookshelves like they did. It wasn't very hard and only required a hammer, nails, palm sander, normal sand paper, spray paint, and some kind of hooks for hanging it. I used Monkey Hooks from Lowe's. My only problem is that I have too many books!! This was a work in progress picture. But I love them! Next up: Hooded Towels!!! This tutorial has been a long time coming. I'm so sorry L! I had high hopes for this towel, but had to scale down my expectations. It still turned out cute and practical. Step 1: I folded my hooded towel over on the short ends and then pinned it to the top of the towel to gauge how big I wanted my hood to be. I ended up cutting off about three inches off of each end. Then either zig zag the ends or fold over for a nicer looking edge, and sew. Step 2: I wanted a pleat in the back of my hood. If you would like the same, read on. If not, skip this step. Fold your bath towel in half, right sides together. Place a pin in the middle. Decide how big you want your pleat to be. I think I measured out a half inch or an inch on each side and placed pins there. There should now be three pins in your towel. Take out middle pin. Pull the two pins together, and squish flat the middle part. The squished part should be on the wrong side of the towel. Pin all pieces of the towel together. Sew over the pleat. Reinforce a lot! Here is the pleat pinned and then sewn together. There should be a "V" on the right side of the towel. Step 3: Fold hand towel in half, right sides together. Sew the long side together. 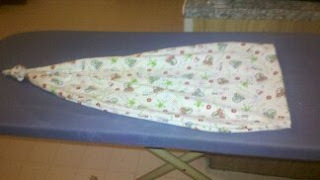 Press flat and sew across the seam on the wrong side, a few times so it will lay flat. (If you want to.) Turn right side out. This is the back of the towel sewn and tacked down. If you want it to lie flat, sew perpendicular to where you just sewed. Step 4: You should now have a hood! Sew ribbon over the top of the hood where you want to. I did mine right on the edge. I also folded the ribbon over a little big underneath so it wouldn't fray, hopefully. Another way to do the hood is to sew a curved line at the back. This makes the hood not so pointy. Step 5: Match the middle of the hood to the pleat in the towel (which is the middle). Pin along the hood, right sides together. Sew. And a few more than I can't remember. Google: Hooded towel tutorial or email or comment with questions! HERE COMES THE GOOD PART!! Lately, I have been working on baby legs and bows for friends. I've gotten all of the supplies to make one of these awesome tie onesies from Crap I've Made for my friend L, and I made one of these swaddler socks for my best friend, S! And I just finished mine for MY SWEET BABY GIRL coming in January!!! We are so excited! :D We took the boys to the ultrasound and they loved it. It was so neat to see our sweet baby. Everything is looking good and she is growing right on track!! Congratulations on the baby girl!! Also, love the towel, very cute,and I'd love to see more of the bookshelf! So exiting! You need another girl in your house. Enough boys! Lol congratulations! Baby girl!! So exciting! Gives me hope that I might have a girl one day, too. And look at you, crafting machine.